Does updating your business technology sound like an over-complicated headache? New hardware and software integration isn’t as complicated as you think! You started out as a small business, but have grown into a larger enterprise. Now you’re looking to streamline everyday processes with new technologies. This is far more common than you think! In fact, it’s rated in the top five biggest tech concerns for many small-medium businesses. 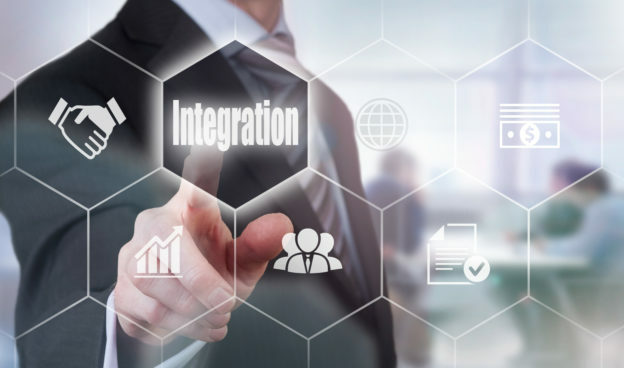 Let’s break down simple ways to tackle hardware and software integration for your business. Computer and system hacking at an all-time high. This is why businesses need to prioritize the security of the systems and networks they are operating. Neglecting adequate software protection could very well be the demise of your business! Fraudsters have taken to email account hacking – well-known as ‘weak spots’. These email phishing scams lurk in your inbox, disguised as a ‘legitimate’ email. Fraudsters aim to entice employees to click on what looks like a ‘friendly’ link. This allows them free access to passwords, customer information, financial information, staff IDs and other data. This is just the start! These email scams can lead to ransomware attacks which could potentially take your business under. The hardware and software integration of your business needs to go hand-in-hand with a robust cyber-security policy. Ideally, this would be set-up by an IT managed services provider you can trust or compiled by your in-house IT management team. Set-up a flagging system for emails with similar content, but incorrect formatting. Phishing email scams often aim to imitate regular emails. As a business owner, it can be overwhelming deciding on the best range of technology tools for your business. Determining what will work best for your business and the exact tools you will need. The day-to-day business tasks which need to be computerized will determine your hardware and software integration needs. This is a great time to look at any existing issues you may have with integrating tech tools in your business. It’s best to tackle those first, before considering new hardware and software integration. Taking stock of your arsenal of existing tech tools will also highlight what is working and what’s not. This should show you where updated tech tools could slot in. Is your business holding onto hardware that is more than 6-years old, yet loading new software onto these old parts? Mixing old and new components creates a load of issues! Troubleshooting, repairs, sourcing the correct parts and software licensing are just a few issues to deal with. It may be high time to let go of the old and make room for the new when it comes to hardware and software integration. One the best ways to install new hardware and software is to leverage your resources. If your business does not have an in-house IT team, discuss installation and set-up rates with the tech manufacturer. Or, hire out the help of an IT professional who understands the ins and outs of hardware and software integration. It’s worth the additional cost of hiring a professional, rather than playing a guessing game of ‘what-plugs-in-where’! The daily tasks your business carries out will determine the exact software you will need. It’s super important that the hardware you purchase supports the software you use on a daily basis. Determine the best software programs to support your daily operations, then make an informed choice on the best hardware to use. There is no harm in shopping around for the best deal! Compare prices from retailer to retailer and shop around for bulk deals on good quality technology. Making a tech update is no a cheap endeavor, so take your time when selecting new technology for your business! Adequate hardware and software protection cannot be stressed enough. Many businesses have suffered massive losses in the crash and burn of hard drives and system hacking. Don’t take the risk – invest in an adequate cyber-security and ensure your hardware is insured! Making a big tech update may involve a little business ‘downtime’. In this case, prepare for it. This is where your business has to come together as a team, continuing daily operations as if nothing has changed! Leverage the support tiers of your business by calling a meeting with each department. Discuss a strategy for how emails, phone calls, and work productivity will be tackled during this time. Be honest and preemptive with your customers. A customer can never hold honesty and transparency against you! What could be worse than a business that doesn’t know how to use its own hardware or software? One of the most important aspects of new tech integration is the training of your employees. Set-up a timeline and train your staff, department by department on the intricacies of operating your new tech. The best way to go about training is to do so before your new tech is installed. That way, once everything has been integrated, it’s back to business! At AME we don’t take risks when it comes to your business tech integration. We also understand it be can be a costly and, not-to-mention, time-consuming update to your business. Our certified personnel are the most proficient in the industry and take your business tech integration seriously. Looking for industry professionals to assist with your hardware and software integration? Contact us for reliable IT support!